Are you still in search of an absolute eye-catcher? If so, our handmade acrylic ice furniture is exactly right for you! Its exclusive ice design and blue lighting create a very special atmosphere, which can be altered by changing the room’s ambient lighting. An absolute eye-catcher with a distinctive ice look, and so simple! 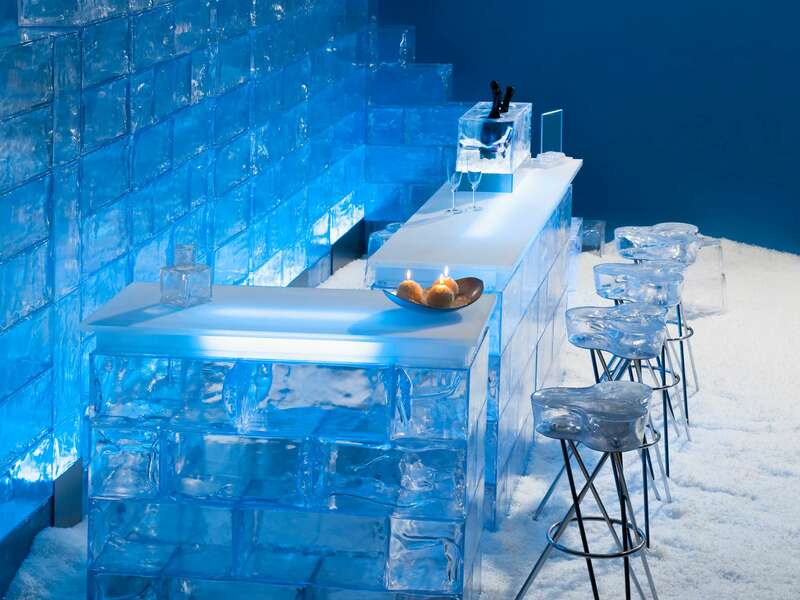 You can give your imagination free reign in designing your ice furniture! 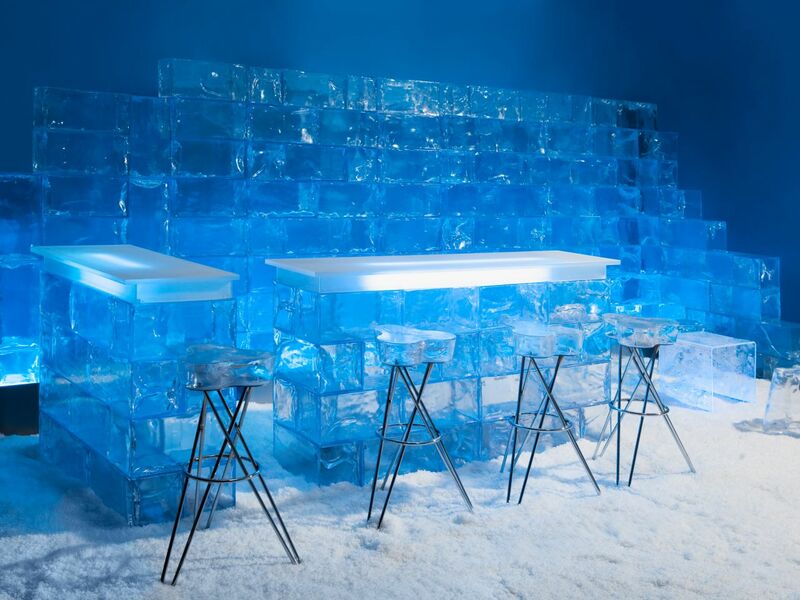 From our “crooked” ice walls, ice pillars, ice tables, ice seating cubes to our ice bars or stools, they are all very simple and easy to assemble and dismantle. 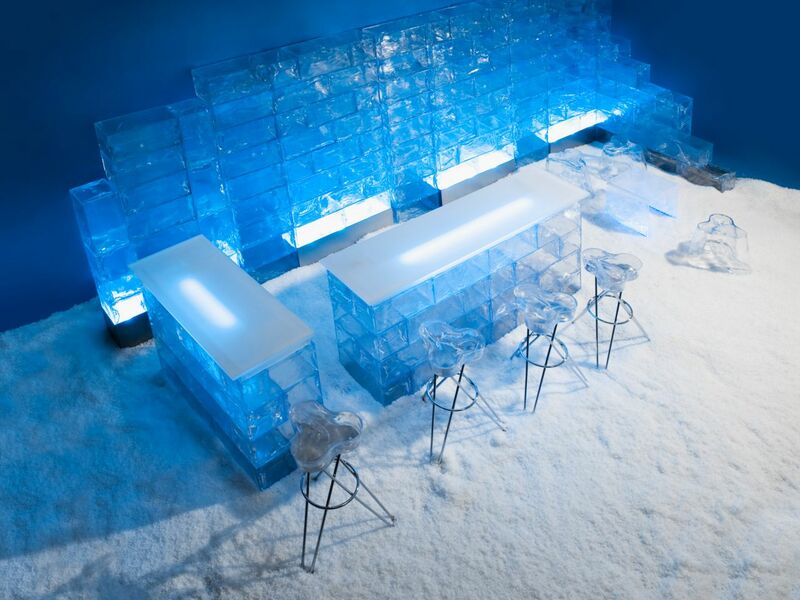 They can also be used in any location; for fairs, entryways, bars, event locations or outdoors - one thing is guaranteed, however, artificial ice furniture is an eye-catcher! You will need our ice cubes (23 x 23 x 23 cm) and/or rectangular ice blocks (23 x 23 x 46 cm), the adhesive tape TESA 4124 for greater stability, Ice Bricks, according to what you wish to build (for curved walls) and connecting rings. For this you will also need one of our aluminium dibond lighting troughs and a socket providing normal electricity. The bar will now be illuminated by a blue neon tube, which is under the countertop. You will need our ice stool with chrome framework and an 80cm diameter and or our 40 x 40 x 40cm ice seat. You can now create this to your individual taste with the assembled ice elements.